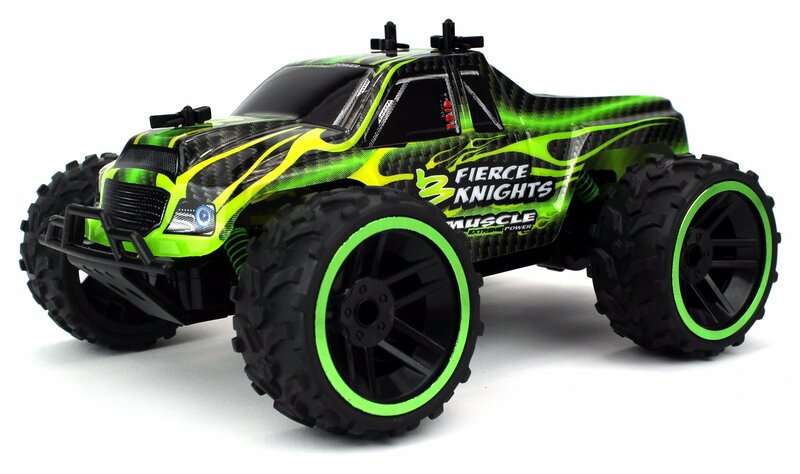 Home › Toys › Fierce Knight Pickup Remote Control Rc Truck 2.4 Ghz Pro System 1:16 Scale Si.. Fierce Knight Pickup Remote Control Rc Truck 2.4 Ghz Pro System 1:16 Scale Si..
Race outside by yourself or alongside a buddy with the Velocity Toys Fierce Knight Pickup RC Truck! -The 2.4 GHz PRO remote system allows you to race multiple cars in the same area at same time without interference! -Race against your friends outside within a range of almost 100 feet. (~98 feet) -Full functions controls and working suspension make handling a breeze! -Features a lightweight, removable body shell as well as premium rubber tires. Features and specifications: -1:16 scale size -2.4 GHz PRO remote control system -Removable lightweight body shell -Full function controls allow car to go forward/backward and turn left/right -Adjustable front wheel alignment -Working front independent and rear hinged suspension with spring shock absorbers -Racing wheels with premium, semi-pneumatic rubber tires -Recommended for ages 8+ and up -Approximate dimensions, 9.5 x 6.5 x 4 inches -Requires 4 AA Batteries to run (not included) -Remote control requires 9v Battery to run (not included) What's in the box: -Velocity Toys Fierce Knight Pickup RC Truck -Remote Control Amazon buyers buy Velocity ToysTM products with confidence. Each Velocity Toys product is made and engineered up to high quality standards. If there is ever any issues or problems with your item, feel secure knowingall Velocity Toys products are also backed by Amazon's 30 day return policy.